We encounter gifted artists and gifted teachers in our lives. Rarely are these traits both as highly developed in one person as they were with Gerald Hodge. Principally a medical illustrator by profession, his personal interests led him to natural science subjects when possible. He actively participated in GNSI over many years, writing technique articles for the Newsletter and Journal, co-authoring chapters in the Handbook and giving presentations and workshops. A few of us had the privilege of studying under him at the University of Michigan. Jerry’s work was exquisite and has inspired legions of Guild folk over the years. 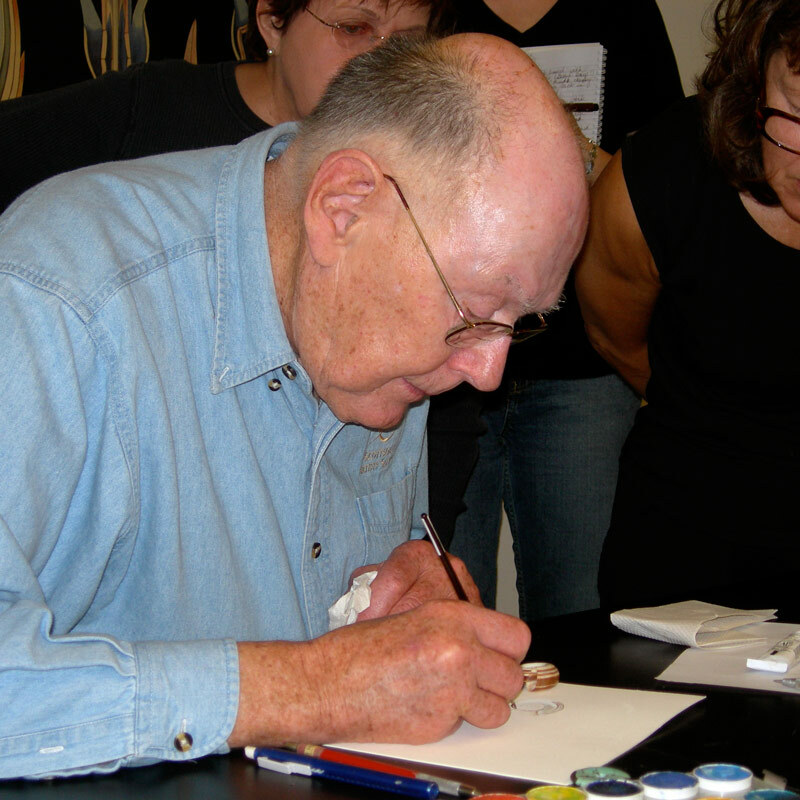 Born in Denver, CO in 1920 he had an early interest in both sketching and our natural world. He studied science in school and finally a professor at the University of Colorado, recognizing his interests and talent, suggested medical illustration to him. WWII interrupted his chosen career, where he served in the Pacific with the US Army Medical Corps. After the war, Jerry was admitted to the Johns Hopkins School of Art as Applied to Medicine the same year as John Cody. They became and have remained close friends ever since. Most GNSI folks knew Jerry as a teacher, illustrator, and mentor extraordinaire. Perhaps not all of us knew that Jerry was a truly able administrator. At the University of Michigan, he built and administered first an illustration service and then an illustration school which was initially housed on the Medical School campus. He used his reputation as an excellent artist to garner support for the service and school. The school was soon highly respected and while this furthered his career, it clearly also helped countless other artists develop their careers. Jerry applied his own exacting standards in his own work as he explored new ground in retirement. Continuing to teach, he has enriched, challenged and inspired many people and contributed to the life of the Guild. Lew Sadler, a former student, called him a National Treasure. The Hunt Institute for Botanical Documentation at Carnegie Mellon University has some of his botanical drawings; his medical and other scientific illustration resides at Johns Hopkins University, the University of Toronto, the Medical College of Georgia, and the Bentley Library, University of Michigan. He recently had a one-man show of 36 paintings at Olivet College, MI. Jerry is the recipient of numerous awards including the Distinguished Faculty Achievement Award from the University of Michigan, an AMI Lifetime Achievement Award, and the AMI Brödel Award for Excellence in Teaching, and its Outstanding Service Award. Jerry also served as president of AMI. During retirement, Jerry was best known for his Trompe l’Oeil Society paintings. One of only seven members of the Trompe l’Oeil Society, he taught his technique at several Guild meetings and at the Scottsdale Artists School for eighteen years. This beautiful work was often exhibited in GNSI member shows. Late in life he explored leatherwork, proving once again - true artists always explore new horizons. Over the years Jerry taught dozens of workshops for the Guild, wrote many Technique Articles for the GNSI Newsletter and Journals, and contributed several chapters for the Guild Handbook. We all enjoyed his famous coffee grounds technique, his much-admired eyelash pen & ink technique, silverpoint and gouache workshops. Jerry was a gifted educator, making all of his students feel capable, nurtured, and well trained. When he suggested corrections it was always in the gentlest manner but always spot-on which inspired long-lasting results in our work. His positive spirit was an inspiration. When we told Jerry he had been chosen to receive the Special Service Award, he indicated he felt it was an honor. Soon after, we were greatly saddened to learn of his death. Accepting the award on behalf of Jerry’s family is his longtime and dear friend, John Cody.